Woah! I cannot believe the girls’ birthday bash has already come and gone! Is anyone else experiencing the quickest year of their lives, too? So, yes, the girls’ bash, lemme talk about that. 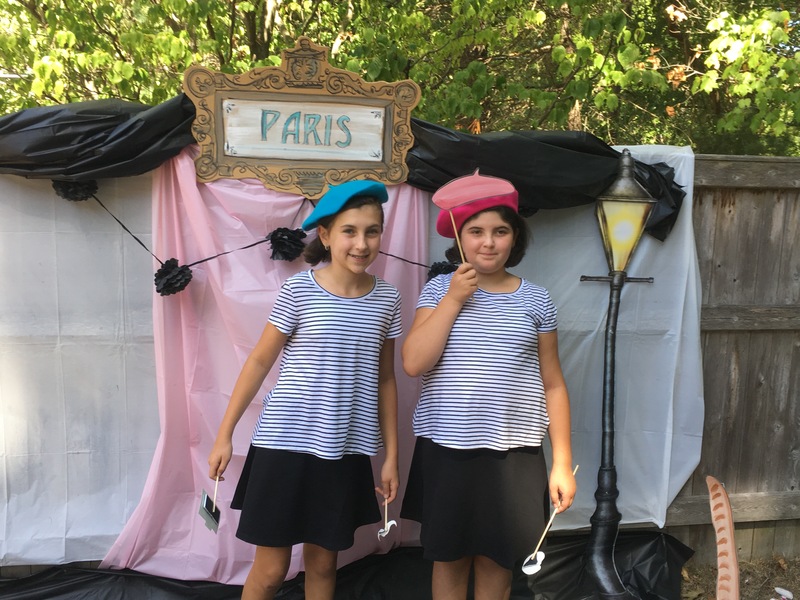 The girls this year picked the theme Paris. I always mention this on the birthday post, but they started to have a joint birthday celebration because they are twelve days apart in the month, and having one party was easier for me and for family when they were little, but now this one big party has become their tradition and they love it. They haven’t yet stopped it and I am going to enjoy this for as long as they let me (cause I love to plan and make the magic happen for them). My husband and I went to Paris in 2011, and absolutely loved it. The food. The wine. The views. It was chic yet old world, urban yet country; it was an amazing place. So, I started with an idea that instead of doing an all out girly party with eiffel towers everywhere, I’d actually invoke the feeling of Paris. This year is the first year in all my party planning history that I used Black and White as the base colors, with a splash of baby pink. Usually, I try to make everything shabby chic with soft greens, so this was hard on me hah. I dressed the food and drink tables in b&w, white bases and black tops. Then I used all and any materials I had to create a Parisienne feeling. There were eiffel towers, vespas, mannequins, signs and even streamed a French Jazz station from Pandora that was perfect! The food table: I had created a sign that read Sister’s Cafe in French and draped some white tablecover from it above the table. Then placed a large garden Eiffel Tower in the corner (that lived in my baby’s room) and then a mini pink vespa in the middle. Then used that faux china that was white with silver lining rings and real silver utensils wrapped in thick white napkins tied in black satin ribbon. The drink table: I dressed it with a drink dispenser, glasses, milk glasses adorned with black satin ribbon and polks dotted straws, three mannequins, a chalk sign and a large print photo..which is from NY, but this is the reason for all this. 1. My sister lives in Italy, and most of these items are hers from when she lived in my parents apartment. Since she wasn’t here, I thought to pay tribute to her fav city by having her ‘here’. 2. NY and Paris are connected by the beautiful Statue of Liberty… annnd 3. The woman in the photo recently died this week and well, it all just felt right at that table! Then at the entrance, which I didnt capture a photo for the first time in six years, I had a large Paris sign with lamp posts flanked on each side. Then I used my bike (because it has a vintage feel) as a decoration with a basket filled with French inspired flowers, a faux bottle of wine and some potatoes. Because everywhere in Paris is side dished with potatoes.. Viva les Frites! I drew this free hand..not too bad! Having access to an artist, well, you ask them to do a lot of things for you because it comes easier to them. So I had asked my husband to print out some signs but he decided to hand pain them for a more vintage feel. The front entrance and the photo booth had the center Paris sign and the food table the cafe sign. So super cute in person. The girls always ask to dress up for their parties, and this year was no different. Thinking about old world Paris fashion, all I could think about were stripes! I got online to scour Old Navy, and found a super cute outfit that I pieced together. It was super cheap, $15 each outfit!, and that they can use all year long as separates. A black and white striped swing top and a black circle skirt from ON. Then through Ebay, I had found two colorful wool berets that matched their personalities perfectly. The food for this party was all on my shoulders as I decided not to get this catered.We always end up with way too much food and I just wanted to do it myself. So. My husband and I stayed up late two nights in a row and nailed it. Trying to make everything from scratch as we could. See when in Paris the big things to eat are steak and fries, everything chicken or eggs, and potatoes.. EVERYWHERE ahah. Since we are living French this day I figured to keep it Frenchy as possible, and I came up with this: Croissants placed in a French wine crate, a mix of Olives, a Salad, BLT baguettes, Mac n Cheese, French Fries, and Chicken Fingers (for my dairy allergy friends). For dessert: Madeleines (a french butter cookie), elephant ears (a french cookie that I call elephant ears hah), the cake and cupcakes, my mother’s pizzelle cookies, donuts (for my allergy friends) and grapes. It was all a big hit! And leftovers were at a major minimum than usual. That’s huge! We also made the cake and cupcakes ourselves, too. I think this will revert back to being bought at the bakery because it’s just a lot of work and I didn’t think it was as pretty as my mind haha. THOUGH everyone liked it a lot. I am particular I guess. We made marshmallow fondant from scratch, after seeing it done on the British Baking show! It came out great. We colored one portion pink and left the other white. We layered the white fondant over a pink and white checkerboard cake then added heart cutouts. We then topped it with the polka dotted cake bunting I made earlier in the week. The pink cupcakes had an overlay of a pink heart with a cupcake Eiffel Tower pick I had made the night before. For the Madeleine cookies, I decided to make a rose shape out of them. I went to my local WalMart to grab a ten inch foam ball and a plastic bowl. I glued the two together and then covered the foam in press n seal wrap. The cookies were then fastened on with toothpicks in an alternating pattern around the foam ball starting from the top. This was super cute in person. Covered the ball with press n seal cling and started attaching the cookies with picks. We decided to make our own piñata again, to try it, because if we failed then we could buy something. So my husband made the cardboard shape and I decorated it. Yes! We made another piñata! This time it was easier and faster for me to make than the Harry Potter one. And what is more Parisienne than the Eiffel Tower? The girls and all the kids loved it. So, I think I am obsessed with photo booth stuff, because this is the third birthday I have made one. SMH. This time I wanted to take the theme and shed that feeling of Paris on everyone. I bought some table covers from the dollar store and draped them with one of the signs, then added tissue pompoms and more of those lamp posts. I thought it came out real cute! The props; I had my husband make me some that I felt were feminine and different from the past years, so he got to painting. I love them! The whole reason for this theme was from my daughter’s request for a painting party.. when I think of art I think of Paris, so she jumped when I suggested it and when I told my youngest she could make the cake she jumped, too hah. Each guest was given an 8*10 canvas, a pallet, then an array of paints, water and brushes were on the table. They were free to paint whatever they liked, and my husband guided them all along the way. They had a great time, didn’t get messy!, and made some impressive pictures..the one photo I got was of the last remaining kid’s paintings unfortunately. Before lunch was served my mother in law opted to face paint all the children. She is so talented, and really made some impressive faces for these kids. All the children had fun, and behaved so well. The weather worked out in our favor, thankfully. And my family and friends got together for these two beautiful kids who deserve the moon. My mom with my youngest…she is tall! I am so glad to have this opportunity each year to make my kids feel special on this day. They are beyond special to me, and because I know this time of their lives is short-lived, I want to make sure when they look back they know how crazy their mom is for them. Just like when I look back on my childhood.